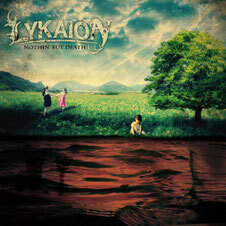 Italian band LYKAION releases their debut album "Nothin' But Death" from Bakerteam Records on June 19, 2012. The band offers a very personal blend of Heavy Metal, Thrash, Hard Rock and Gothic, very well balanced between powerful sounds and melancholic atmospheres. After having played hundreds of shows all over their native Italy, LYKAION is finally ready to unleash their fury in the rest of the world. "Nothin’ But Death" was recorded and mixed at 16th Cellar Studios by Stefano “Saul” Morabito (Fleshgod Apocalypse, Adimiron, Hour Of Penance) and mastered at Fascination Street Studios by Jens Borgren (Katatonia, Opeth, Symphony X, Paradise Lost, Amon Amarth). The beautiful cover artwork was handled by Sergio Monfrinotti (Adhiira Art). The album is available at amazon.com and Bakerteam Recoreds.